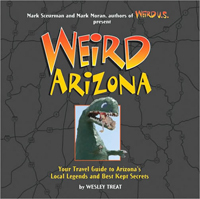 Arizona is an amateur archeologist's dream, rife with ancient cliff dwellings and petroglyphs left here by some of America's earliest clans. For the avid prehistorian, this is the place to spend your summer. 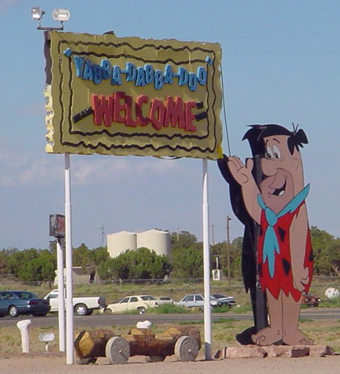 But if your interests lie with less archaic American history, Arizona still has you covered with the ruins of a more modern stone-age family in Flintstones Bedrock City. Located about half an hour south of the Grand Canyon, where Highway 180 meets 64 in Valle, this often lonely attraction is a wonderland for those of us who grew up in the '60s and '70s, especially those of us who adore a nice, cheesy roadside stop. In two pathetically punful words: it rocks. Take a tram ride through a forty-foot volcano or crawl through the dark belly of a giant prehistoric snake. Have a Bronto Burger at Fred's Diner, then witness some of your hosts' cartoon misadventures at the Bedrock Theater. Of course, don't forget to slide down the tail of Slate Rock and Gravel's big, green brontosaurus and belt out a hearty "Yabba-dabba-doo!" Mostly, you'll have a gay old time exploring Bedrock's faux-stone buildings. There are the Flintstones' and Rubbles' houses, of course, as well as a post office, beauty parlor, gas station and police station with jail, among others. All the details are there: saber-toothed-tiger-hide bedspreads, a pterodactyl record player and pet dinosaurs. At the general store, you can pick up some dinosaur ribs and comically large watermelon slices for dinner. (Though, disappointingly, you won't find any Pebbles cereal.) Outside, see if you can kick-start one of the scattered, foot-powered vehicles. 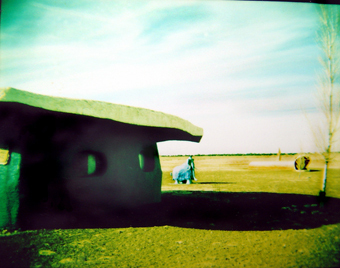 Bedrock City has been around since Francis Speckels, son of an investor in a similar park in South Dakota, built the place with his family in 1972. And, although the park recently replaced its somewhat homely statues of the show's main characters with glossy, new fiberglass versions, tourists report that the place is starting to show its age, suffering from entropy and a touch of graffiti. Evidently, the statues' prerecorded voices no longer work, dust covers everything and building corners are starting to crumble. But most seem to agree the subtle hints of disintegration add to the park's fantastic weirdness. Me, I'm waiting for somebody to open Jetsons Orbit City.